I’m not adding anything new to the world of Simpsons criticism – from people far more informed than I am – when I say that where season 9 was the turning point, season 10 is where it’s clear this show isn’t what it used to be. There’s a tendency to claim that while the glory days are now behind The Simpsons, weak Simpsons is still better than most TV. 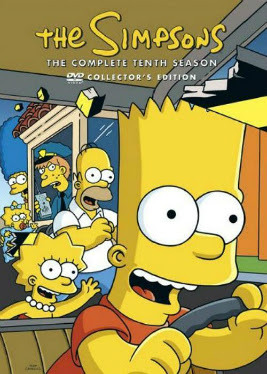 But compared to most other animated sitcoms, whether Futurama or King of the Hill or South Park or even Beavis and Butthead, from here on in The Simpsons is sorely lacking. It’s right on the brink of not-worth-watching at this point, and I found some episodes decidedly tedious. And yes, the main problem here is Homer. He’s now absolutely the show’s main character, but he’s also a self-centred, borderline psychopathic, narcissistic weirdo. He was once so relatable, and now he’s a proud criminal and unbelievable moron who I find it hard to believe anyone would like if they started watching the show from this point. No longer Fred Flintstone, he’s become more Felix the Cat, and that’s hard to stomach. There are some decent episodes here, especially toward the beginning of the season, like ‘The Wizard of Evergreen Terrace’, where Homer actually shows some conscience after coming up with a scheme to destroy a piece of American heritage. Bart shows a bit of depth in ‘Bart the Mother’ and the moment where a whole awards ceremony is faked for Lisa is probably the funniest moment of the season, alongside Homer surveying his newly-built barbeque. Homer’s stint as a bodyguard also has its moments. This is also one of the few example of an episode where there are two plotlines where both are good (Homer gets a pet lobster concurrently with Lisa’s cheating dilemma, and both are amusing stories). Too often, there is a strong strand and a weak one, and sadly it usually falls to Marge and Lisa to pad episodes with some dull time-wasting, like trying to find a missing jigsaw piece or getting a new doorbell. Some ideas are good and badly-executed, like the kids setting up a pirate radio show, ending with a terrible musical number, or Homer and Ned’s trip to Vegas which jettisons all its interesting moral questions very quickly. Other ideas are just terrible, like Homer becoming friends with a Hollywood couple in a bizarre self-congratulatory celebrity episode. More could have been done with Homer looking into his roots than him being a horrible person to hippies, and the Treehouse of Horror episodes are wearing thin, especially as they are no longer the containment episodes for surrealist sequences. Trips abroad are terrible, the Scotland jaunt being weirdly tacked-on and the journey to Japan being embarrassingly less amusing and insightful than one phone call to Japanese people about Mr. Sparkle. The Steven Hawking cameo also isn’t nearly as funny as I remember it being. This is a disappointing series where the saving graces are few and far between, and I don’t predict any improvement from here. It’s also a little sad to note this is the end of Phil Hartman’s characters Troy McClure and Lionel Hutz after his murder. He would have made a great Zapp Brannigan.